Have you ever purchased something, worn it once and then put it away? We all do it, too many times then we would like to remember. When we hit it and have something that we love and wear it to death, I must admit it is a great feeling. As I get older, I challenge myself to find those items, hold off buying frivolously. Well I have hit one big. 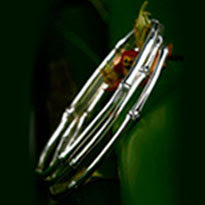 With all the choices one has, and I am fortunate to have choices, I find myself gravitating day after day to my John Hardy Bamboo silver bangle bracelets. They take on a personality of their own with each outfit that I put together. They have attended black tie events in NYC with me, I have to admit I did add a few thin diamond bangles to make them really sparkle, but day after day I just keep piling them on. I started with a mere 5 and I think that they are now 20 strong. It is the simplicity of them that I love...... Yes bamboo is in at the moment, but it is timeless "in". Everything needs to be timeless not trendy. Bonus, with the purchase of each bracelet John Hardy will plant 3 bamboo seedlings on Nusa Penida Island to fight Global Warming. A win win for me, something I love, fashionable, and helping our environment. It is very useful accessories i like it, Thank you for sharing this.